Downtime is something that a company has to deal with from time to time. There are times when an IT or manufacturing company must stop services or production processes to carry out maintenance or upgrade existing machines for better work performance. This kind of downtime is harmless. But, downtime can escalate to dangerous one very quickly when it happens unplanned. There are many factors that cause downtime. Some of them are an operational error, minimal equipment maintenance, broken hardware or software, and various other things. At the level of multinational companies, downtime has the potential to cost the company up to billions of dollars annually. A report said that an IT company could lose up to $ 84,000 to $ 108,000 every hour during downtime. The same thing also happens in manufacturing companies. To reduce losses, there are several steps that can be taken by the company. This time, we will provide 10 tips that you can do to reduce the losses that occur due to downtime. It’s not fun to do, but it needs to be done nonetheless. Risk auditing is the fastest and most effective way to reduce downtime losses that may occur in the future. An example of a risk audit is identifying obsolete equipment. Even in the most modern manufacturing companies, it is common to find equipment that is 10-20 years old. Furthermore, the equipment spare parts are often difficult to find because it is no longer produced by the company where you bought it. If the equipment is broken, there are many possible consequences, such as the safety of the workers around the engine, the quality of the products produced by the engine, and the long downtime due to difficulties in finding spare parts. With risk audit, you will be able to see problems that might arise, so that when downtime occurs, you won’t panic. The biggest mistake of a manufacturing company manager is not counting how much money the company losses during downtime. Even five minutes of downtime can potentially harm you in large numbers! These downtime losses include no productivity from employees, no items are produced, potential working hours that must be rescheduled, equipment repair costs, time wasted serving customer complaints, and damage to the company’s image. Downtime must always be calculated in the form of currency. In this way, you as a company manager can focus on preventing losses when downtime occurs. Signs of equipment breakdown can generally be seen in three aspects. The vibration produced by the device is greater than usual. The tool gets hot faster than before, or the engine noise is louder than usual. These signs may difficult to see with a naked eye, but the sensor can detect those irregularities easily. Fortunately, sensors like this are relatively inexpensive and not too large in size. Don’t hesitate to buy sensors like this to avoid equipment damage that potentially causes losses on a greater scale. In 2019, there are a lot of manufacturing companies which still create reports and do data collecting manually. Unfortunately, making reports and collecting data manually will only make downtime lasts longer and costs you a lot of money. All you need is report generation and data collection automation. This automation can only be achieved using supporting software such as ERP manufacturing. This software will give you access to data in real time. Thus you will know exactly when your machine has stopped operating because it needs maintenance, and identify which activities are interrupted by the accident at the same time. With this data, you can react correctly and quickly. Let’s face it, every software or hardware used by your manufacturing company comes from a variety of different companies. No matter how reliable your technician is, you will certainly have difficulties when your technician required to handle two different devices when it is broken at the same time, or when you have to troubleshoot two software which functions differently. That’s why you need help. Make sure you have at least the contact number of the technician from every equipment and software in your company. If you use manufacturing ERP, make sure you selected the right ERP module for your company and thoroughly consulted about it before you implement the ERP module in your company. After hardware error, an operational error is the second most common cause of downtime. A good operator is the one who has the ability to detect whether the machine they handle showing signs of error. Even better if the operator knows when it should undergo maintenance. This is why employee training is very important in a manufacturing company. In addition to mastering the equipment, the production will be even more efficient if the operator can solve the problem of the equipment by himself, thus the potential for downtime can be minimized. For those of you who have a motorbike or an automobile, you certainly know when you have to change the oil and perform routine maintenance at the nearest workshop. Apply the same thing in your manufacturing company. Just like your motorbike/car, regular maintenance reduces the possibility of breakdown and the possibility of downtime, and also increasing safety and productivity. Unfortunately, there are still quite a number of manufacturing companies out there who don’t care about this. They continuously run their machines without any maintenance at all. In fact, just like a motorbike that is not maintained, we do not know when the engine suddenly broke down and made the loss bigger. Make notes of the condition of each equipment in your manufacturing company and make this a corporate culture. By recording when the last time a machine undergo maintenance, which parts that have been replaced, what are the signs of damage seen in the sensor, it will make maintenance easier and downtime easier to avoid. Growing a culture like this might be difficult at first. But with time and discipline, this is not impossible to implement in your manufacturing company. Imagine what happens if the software that runs a machine is accidentally erased due to a staff error? Not to mention that the company whose developed the software closed a few years back so no one can provide you support. The worst thing that might happen from the situation above is you have to recreate the software, delay the production process for two weeks. Nightmare! This is the reason why a backup process is an important thing that must be done regularly, besides regular maintenance. As a manager or leader of a manufacturing company, you must have a proactive mindset. Which means; do not wait for a disaster to happen, but actively identify where potential disaster might occur so that damage can be reduced and downtime avoided. One of the proactive steps is making your company environmentally friendly. An environmentally friendly company is not only effective in reducing downtime, but also enhancing your company’s image in the surrounding community, reducing waste, and ultimately increasing the profit the company gets. Downtime prevention can be done in various ways. However, as effective as any prevention program you do, it will not work if it is not supported by disciplined and dedicated human resources to run the program. 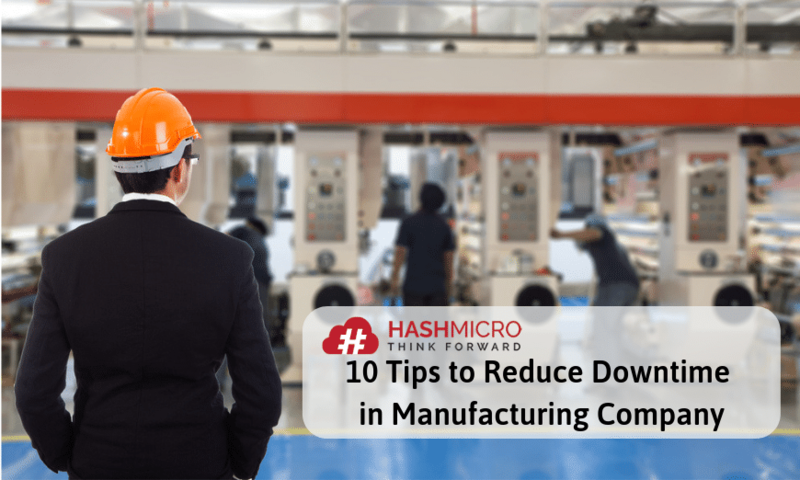 For tips and other reading about the manufacturing industry, visit the HashMicro blog.